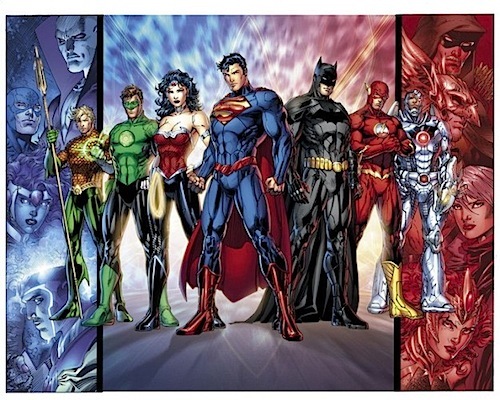 In case you haven't heard, DC Comics is undergoing a relaunch in September. DC is releasing little bits of information at a time but one thing is sure--they are ruining the records set by Detective Comics and Action Comics by starting over with #1s. But a true mystery surrounds the first issue of Justice League by Geoff Johns and Jim Lee. All other characters have been identified except for the woman on the right side in the middle. People have speculated that it's Black Canary or Power Girl or even Zealot, a character from Jim Lee's WildC.A.T.S. but I have a different theory and it's a good one I think. Dan Didio, publisher of DC Comics stated during a convention that most people are now familiar with the Green Arrow from Smallville and that they want to incorporate some of that history into this Green Arrow. So my thought is that this mystery woman is Watchtower extraordinaire and future wife of Oliver Queen: Chloe Sullivan. Sure Geoff Johns tweeted that the woman is not a blonde but since Chloe was specifically created for the TV series, who says they can't re-envision her for the DC Relaunch? Veeblefester has millions of dollars, a successful tea cozy company, a house on a hill overlooking a private lake and three beautiful young gold-diggers. Who would want to improve that? Although if was bald like Veeblefester I would wish for hair.